These two Lombok waterfalls are located in the foot of Rinjani mount which also a part of track to this highest mount in Lombok Indonesia. 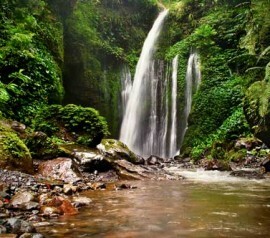 Administratively, these lombok waterfall located in Senaru village, about 2,5 hours from Mataram city with personal car. You can also use public transportation to reach this place, but with the public transportation availability and time consideration, its recommended to take personal/rental car. There are two routes that you can take, first is the route of Rembiga-Anyar-Senaru, and the second is Mataram-Ampenan-Pemenang-Anyar-Senaru. If you choose the first route, you will pass Pusuk woods, which you will find monkeys in this wood playing in branches and sitting in the side of the road. You may stop for a while to feed them while enjoying the scenery. If you choose the second route you will enjoy beach scenery all along the way you take, then you will find sign board which says : ‘Welcome to Sendang Gile and Tiu Kelep Waterfalls’. To enjoy these waterfalls, you have to buy entrance ticket. 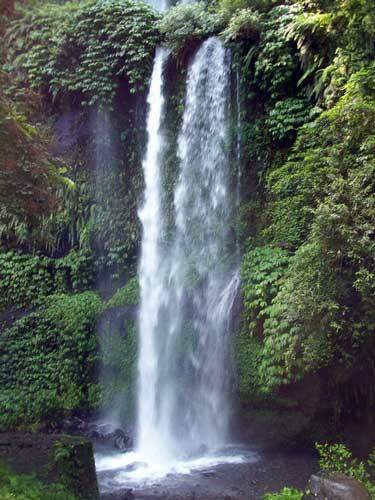 After that you can straightly go to Sendang Gile or Tiu Kelep waterfall first. Once you got there, you will see the mist which forms a rainbow when it hit by the sunlight. Tiu Kelep waterfall is above Sendang Gile waterfall, and it becomes the continuity of the Tiu Kelep. The flows of Sendang Gile is passing layered rock steep bank with height around 30 m. the layered steep bank is covered with leaves and fern plants. Sendang Gile waterfall is closer to the entrance of waterfall area. To get there, only take 15 minutes by foot. Because it closer to the entrance, it is visited by more visitors, either its foreign or domestic one. 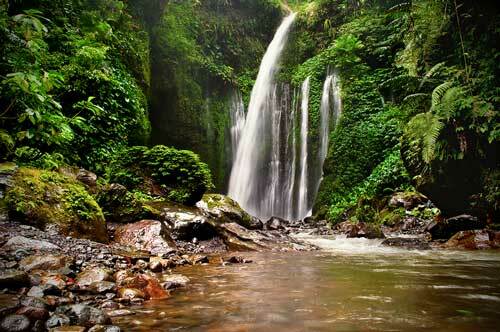 If you don’t like tracking, Sendang Gile waterfall a perfect option for you. Along the way to get into these two waterfalls, you may enjoy the scenery of protected forest which is a part of Mount Rinjani National Park. The dominated trees in Senaru Lombok village are tropical trees such as bajur tree (Pterocarpus sp. 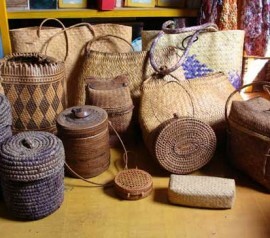 ), ipil tree (Insia biyuga), sentul tree (Sondarium), and jati tree (Tektona grandis). Even if it’s dense with trees, you don’t need to worry of getting lost, since the path to Sendang Gile waterfall is so clear. But if you feel you need help, you may ask a local guide to show you the path to the waterfall. The path which forms stairs to Sendang Gile is quite comfortable to be taken. Even, you still have to be alert, since many small and big stones around Sendang Gile waterfall. If you stand in a higher ground, you will see the crush and flowing waters. You could also relax by sitting on the stones which face to the waterfall. To warm up yourself, you could have a coffee which you can buy in the food stalls nearby the waterfall. 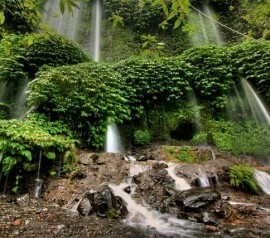 If you like tracking, try to continue the journey to Tiu Kelep waterfall. To get into this second waterfall, takes 45 minutes by foot. 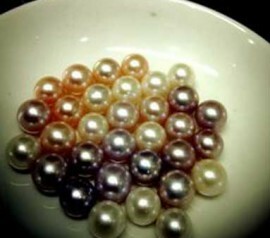 You will pass a quite sloping stairs and also shallow rivers with clear water as well. You will also pass a path which in each side is small river with calm water. The exhaust feeling will soon disappear after you see the waterfall. This waterfall is quite high, more or less 45 m with big and strong crush. If you don’t want to get wet, you should wear your waterproof jacket. Nearby the waterfall, you will see an interesting view of big trees which live in the valley’s surface. 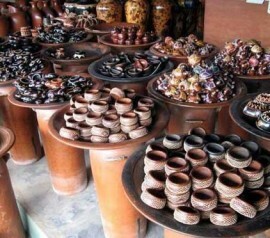 According to local people, Tiu Kelep name is taken from Sasak language. “Tiu” means pool, and “Kelep” means fly. While Sendang Gile name is taken from a legend which tells about the story of a prince which was chased by a crazy lion. He ran into a wood and hide behind a waterfall. This waterfall then called Sendang Gile waterfall. The two waterfalls are believed by the local people as a cure to many diseases and can make someone looks young all the time. The local people also believe that the water flow will come bigger if people around are talking loudly. The clean air of Lombok nature and the beautiful scenery will make you comfortable to stay longer here. But if you want to enjoy view from different angle, in your way back home try to step by in a restaurant named Senaru restaurant which located in high area. 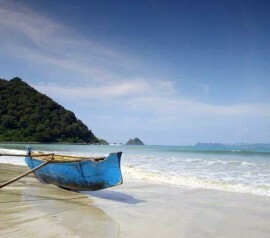 In this restaurant you will enjoy the scenery while tasting special food of Lombok. 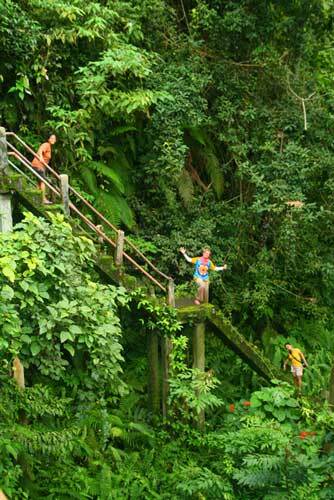 You can also enjoy the forest and valley panorama which cover Tiu Kelep and Sendang Gile waterfall. Also mentioned: sendang gile waterfall, randonnée sendang gile waterfall, visiting lombok waterfalls, kelep, tiu kelep sendang gile. Use non slippery footwear that fit to a quite steep field. Better not visit this place at rainy season. Bring for exchange clothes if you want to do shower in the waterfall. Avoid being in the place where the water falls (especially in Tiu Kelep waterfall), because the falling water form a spin stream that can drown you. Protect your camera, and other electronic stuffs while you’re in the waterfall area. Don’t damage, pull out or taking home any kind of plants or animal from the waterfall area. Public Facilities: accommodation, restaurant, food stall, parking place, public toilet, information centre, gazebo, and small mosque.